Explanation: Now approaching our fair planet this Comet PanSTARRS (C/2013 X1) will come closest on June 21-22, a mere 5.3 light-minutes away. By then its appearance low in northern hemisphere predawn skies (high in the south), will be affected by the light of a nearly Full Moon, though. Still the comet's pretty green coma is about the apparent size of the Full Moon in this telescopic portrait, captured on June 12 from the southern hemisphere's Siding Spring Observatory. 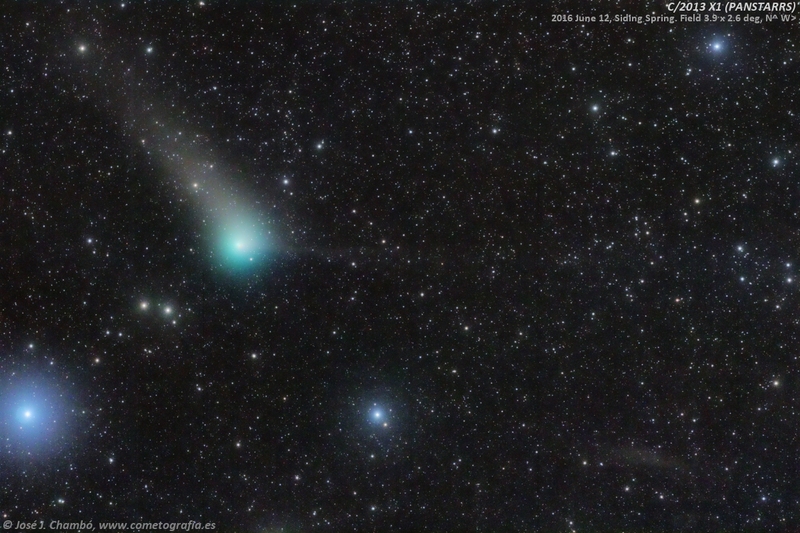 The deep image also follows a broad, whitish dust tail up and toward the left in the frame, sweeping away from the Sun and trailing behind the comet's orbit. Buffeted by the solar wind, a fainter, narrow ion tail extends horizontally toward the right. On the left edge, the brightest star is bluish Iota Piscis Austrini. Shining at about fourth magnitude, that star is visible to the unaided eye in the constellation of the Southern Fish.